When Didi Menendez, publisher of PoetsArtists Magazine, invited me back to curate a special edition for the second time, I jumped at the opportunity without hesitation. Curating Idiosyncratic Monochromes in 2017 was a tremendously enriching experience for me, especially because that issue was so well received. This time, to juxtapose the previous monochromatic theme, I chose Glorious Color as the starring leitmotif and published a call for submissions asking for paintings and drawings created in vivid, bright, intense colors. My objective: To publish a spectacular anthology of realist artwork expressed in vivaciously flamboyant color schemes that will show the artists’ bold and intrepid use of a variety of polychrome palettes that will wow the reader. As sentient beings, we learn about color through experience, subconsciously associating each color with a personal thought, feeling, or specific memory. This partly explains why we passionately love one color and profoundly dislike another. Despite scientists and artists trying to ascribe universal attributes to specific hues, color preference and meaning remain enigmatically subjective—we all see, feel, describe, and remember color in a very personal way. In his book Chromophobia, British artist and author David Batchelor reasons that, “in the West, since Antiquity, color has been systematically marginalized, reviled, diminished, and degraded.” He labels this phenomenon “chromophobia”—described as the fear of color marked by a desire to eradicate and/or master the forces of color. Over time it seems intense color has come to be perceived as dangerous, superficial, and potentially contaminating, while white, black, and other neutrals are valued as rational, clean, and controlled. Of course, every color carries a certain cultural assumption and association, but in today’s world bright colors are often avoided, especially in regards to important investments. We witness this in the color choices we make for our homes and cars. Color psychology is extensively used in marketing because color influences consumers’ perceptions of goods and services. Commercials show subtle beige interiors as tranquil havens of affluence and black cars as an emblem of importance—moreover, both are easily resalable, while a bright yellow kitchen or a pink car are not. It seems as if seductive, emotional, and fascinating colors are only acceptable in small doses—we might wear a flamboyant scarf, electric blue nail polish, or paint one accent wall vivid orange. We are afraid we’ll get bored with the bright purple sofa, change our minds about the huge turquoise painting, or that others will feel contempt for our loud, gaudy color choices and label us as kitschy and unsophisticated. I suggest it’s time we get over our collective chromophobia and embrace color in a big way! We delight in bright colors in nature—think chameleons, parrots, tropical fish, flowers, rainbows—so maybe we should start incorporating more vivid color into our daily lives. And there’s no better place to begin than by delighting in some vibrantly colorful art… and perhaps even hanging it on our walls. And, dare I suggest it, get the couch and curtains to match! What appeals to me in multicolored artwork is its sense of exhilaration—in a mysterious way it offers joy to the senses. For this PoetsArtists issue I envisioned a sophisticated yet outrageously loud collection of multichromatic paintings that result in a must-have art publication worthy of special edition status. All selected pieces fit the key principles of what I consider to be brilliant examples of Glorious Color. Some paintings rely on white or neutral backdrops but their focal color palettes are so exciting that I just had to include them. I selected a total of 50 pieces—and yes, I shamelessly added one of my own, just because… hey, I can. Accompanying each painting, I write a little bit about the artist and also clarify my reasons for including the piece. Independently, each painting stands out for its individual splendor and amazing color. Seen together as a collection, these paintings form a stirring and inspiring survey through the courageous expression of glorious color. ☘ Click HERE to see below selection of paintings on Artsy! ☘ Click HERE to buy a print-on-demand paper magazine or digital magazine! 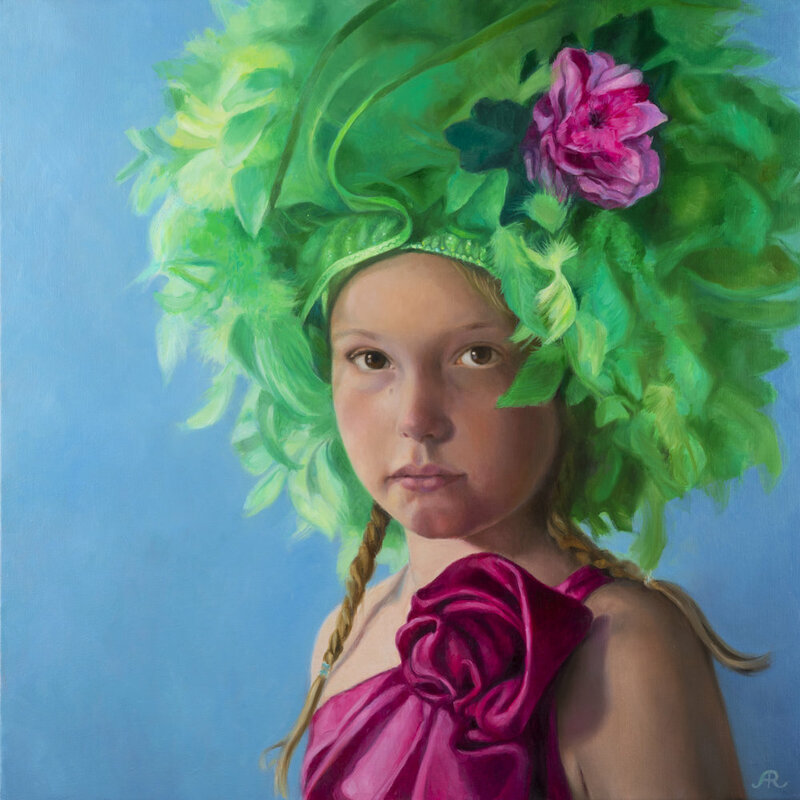 Astrid Ritmeester is a Dutch portrait painter based in Bussum, the Netherlands, whose background in theater costume design inspires a dramatic touch in her bright, contemporary portraits. Ritmeester applies 17th Century Dutch and Flemish painting methods, skillfully using subtle, loose brush strokes with a gifted eye for color, values, and beautiful soft edges. Ritmeester’s remarkable portrait, entitled Make Believe, draws me because of the ingenious placement of intense color expressed through elegant painterly brushstrokes which capture recognizable textures so well. The direct gaze of the young girl—both innocent and knowing at the same time—seem to question the authenticity of the world around her. Carin Wagner is an American realist artist based in Palm Beach Gardens, Florida, who paints landscapes, skyscapes, and closeups of nature. Her paintings convey the idea of mutually beneficial responsibility, in that the valuable cycle sustaining life on earth can only endure if we respect, safeguard, and preserve the delicate ecological system. Wagner’s beautiful cloudscape, entitled Sky XI, draws me because of its tranquil beauty and euphoric color palette which is both peaceful and powerful at once. The expression of light is superb within this highly recognizable abstraction. Evocative of summer evenings, these soothing clouds encourage meditation on the things that are most important. Daryl Zang is an American artist based in Newtown, Connecticut, who creates still lifes and figure paintings that are inspired by her own life experiences, serving as a visual journal of her most personal thoughts. Zang’s artwork is infused with the memories and emotions associated with the subject matter, aiming to spark a sense of recognition and nostalgia. Zang’s vivacious painting, entitled Surface, draws me because of its celebration of sunlight and summer play. 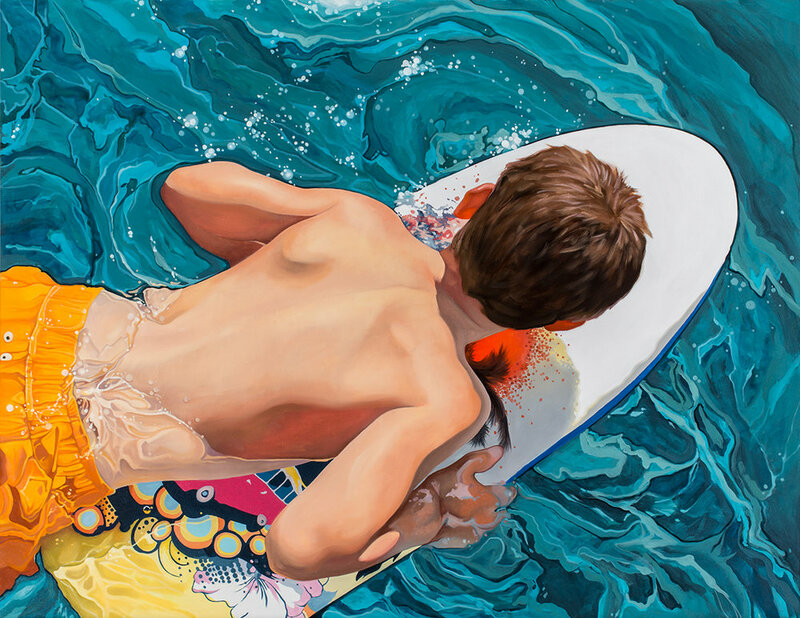 The vibrant color palette enhances the strong composition, expressed in a skillful—almost graphic—painting style which cleverly juxtaposes the cool transparency of the water against youthful tanned skin, shiny board, and wet fabric. Doug Webb is an American painter based in Calabasas, California, who is known for creating a hybrid of surrealism by altering scale and placing unexpected oversized objects within surprising panoramas. Webb’s hyperrealist paintings always contain meaningful metaphors delineating interesting narratives that often denote historic or sociocultural events. Webb’s extraordinary painting, entitled The Allure of Opposites, draws me because of its meticulous detail and unexpected whimsy. There’s something blatantly suggestive about New York’s Chrysler Building surrounded by gigantic roses. The ephemeral blue of the sky and the intense pink of the flowers beautifully frame the faithfully detailed skyscraper. John Hyland is an American artist based in New York City, who uses oils and dry media to paint a variety of subject matter ranging from portraits, figures, and still-lifes to landscapes, seascapes, and interiors. His background in journalism influences his artwork in which the underlying narrative aligns beautifully with an unrestricted yet meticulous execution. Hyland’s stylish painting, entitled This Same Flower That Smiles Today, draws me because of its fabulous color palette capturing the essence and beauty of this quintessential Tiffany lampshade. Sharing Hyland’s love for Tiffany’s leaded glass objets d'art, this painting stands out for its bold yet unpretentious statement and the delicate rendering and luminosity of handmade glass. Kerra Taylor is an American artist based in Springfield, Missouri, who paints theatrical paintings creating an exaggerated reality that stretches beyond the ordinary. Taylor aims to encourage viewers to interpret the narrative of her unusual compositions through their own experiences by representing highly detailed and lively scenarios. Taylor’s idiosyncratic painting, entitled Kids Go Bump in the Night, draws me because of its humorous and perplexing subject matter, festive color palette, and the amazing wealth of interesting details and textures within the scene. The rowdy tableau triggers the imagination and piques our curiosity while we scrutinize the wealth of interweaving minutiae. Laura Tan is an American artist based in Miami, Florida, whose body of work chronicles three decades of expressive self-portraits that record how she feels and sees herself in an unfiltered response toward particular moments in her life. Tan portrays herself without frills, bluntly presenting herself as she is, usually gazing directly at the viewer. Tan’s powerful self-portrait, entitled 3 Sheets, draws me because of its honesty, thought-provoking expression, and beautiful application of intense, recurrent colors. The lack of self-consciousness and the solemn attitude celebrate the plight of contemporary womanhood, sending a powerful message of self-acceptance, inner strength, and purpose. Lisa Fricker is an American artist based in Denver, Colorado, whose colorful impressionistic artwork focuses on figures and florals. Highly inspired by encounters with strangers, she eloquently explores the pictorial complexities of scenes found in public places which she captures in her pastel series entitled Encounters at the Fair. Fricker’s outstanding piece, entitled 3 Darts $5, draws me because of its exquisite multichromatic palette, superb application of the medium, and fascinating, energetic scene. The wonderful abstractions of the setting juxtapose beautifully against the more in-depth depiction of the jaded young woman waiting for her next customer. Megan van Groll is an American figurative painter based in Dallas, Texas, who explores identity, gender, and psychology through her portraits and narrative paintings of the female form. She seeks to bare the essential and intuitive aspects of the female experience—the emotional, psychological, and sociocultural forces that shape contemporary womanhood. Van Groll’s exceptional painting, entitled Crush, draws me because of its compelling use of color, poignant depiction of skin textures, and ambiguous and provocative narrative. The adept exploration of contrasts and paradoxes cleverly embrace ugliness and beauty, darkness and light, discomfort and ease—provoking a visceral contemplation of our deepest emotions. Natalie Holland is a Russian-Norwegian artist based in London, United Kingdom, whose realist paintings—namely portraits, figure paintings, animals, and still lifes—are based on classical painting methods. Her subject matter focuses on contemporary societal narratives such as feminism, human rights, religion, and contemporary sociopolitical challenges. Holland’s poignant painting, entitled Light Warriors, draws me because of its exquisite color contrasts, great balance between realist and graphic elements, and its highly compelling subject matter. The figures’ body language and facial expressions convey a strong sense of guardianship, mutual devotion, and trust, as well as a wonderful sense of quiet dignity. Rachel Linnemeier is an American artist based in Tucson, Arizona, whose narrative paintings portray young women engrossed in situations that evoke a certain tension between the idea of contemporary adulthood and residual childhood. Linnemeier’s compositions include well-defined details as well as out-of-focus perspectives, expressed in bright, vivid color palettes. Linnemeier’s exuberant painting, entitled Blew Mood, draws me because of its gorgeous balance between warm and cool hues, and its great descriptive qualities and sense of spirited playfulness. The exquisite details—such as the reflective sunglasses, the jewelry, the little jar of soapy water, and the patterned fabric—are a feast for the eye. Robert Nelson is an American artist based in Whittier, California, whose work is highly defined by his experience as a Graphic Designer. Based on his perception regarding the conflicting and changing values held by individuals, he examines the contrasts between ideas such as innocence versus corruption, the infinite versus the finite, past versus future, and good versus evil. Nelson’s exceptional painting, Awakenings 4, draws me because of its eye-catching and sophisticated composition, strong and exciting color palette, and its stimulating, thought-provoking essence. The chemistry between detailed, recognizable subject matter and graphic elements creates a highly compelling, theatrical, and idiosyncratic vision. Shannon Fannin is an American realist vehicle painter based in Austin, Texas, whose elaborate paintings capture the fascinating personality of cars, motorcycles, and other means of transport. She aims to spark childhood memories or long-held dreams of ownership through the portrayal of perfectly polished enamel, highly reflective chrome, and fascinating bodywork. Fannin’s exciting painting, entitled 1959 Cadillac Coupe deVille Red, draws me because of its deep contrasts, imaginatively cropped composition, and beautiful photorealistic expression. This captivating piece draws the eye through its myriad of alluring details—both of surfaces as well as the reflections of the surrounding world—created by loose brushstrokes and finger-painting. 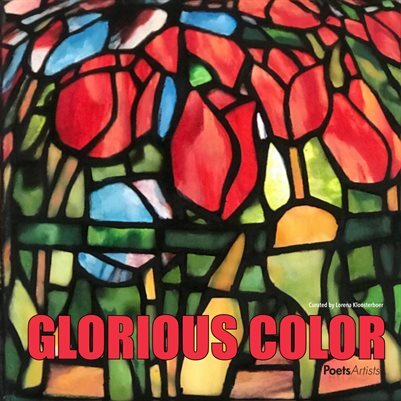 Buy the special PoetsArtists edition of GLORIOUS COLOR to enjoy all fifty exceptional paintings!